Russia appears to be ready to deploy ground forces in Syria. Today, Adm. Vladimir Komoyedov, who chairs Defense and Security Committee in the Russian Federation Council, said Russian “volunteers” could soon be deployed to Syria to support the Syrian army on combat operations, Russia’s news agencies reported. CNN also reported that Russia is moving artillery and rockets from its base of operations at Latakia airport to Idlib and Homs for a possible ground operations against the opposition forces. Russia has in the past successfully deployed its Special Forces, Spetsnaz, for counter-insurgent operations, including in Chechnya, Crimea and eastern Ukraine. 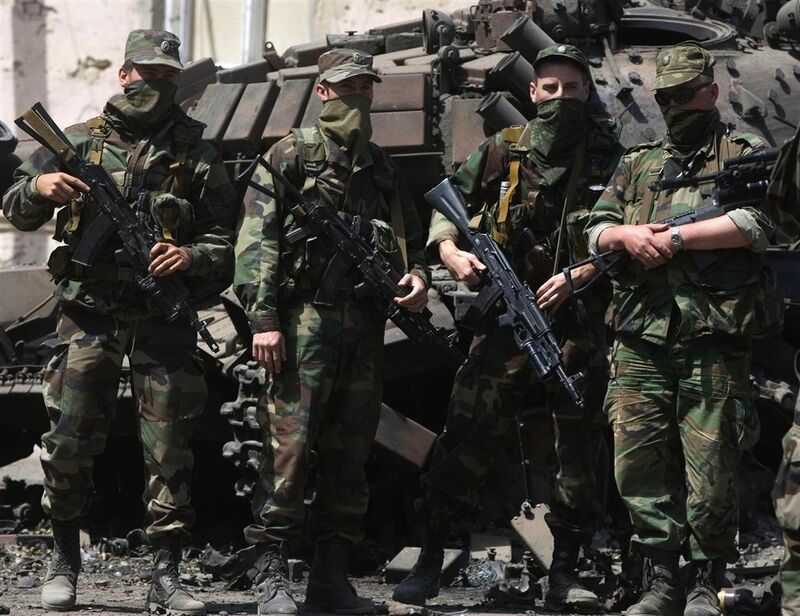 The volunteers heading to Syria could well include elements of Spetsnaz. The addition of Russian ground forces into the battle, supported by Russian airstrikes, would dramatically elevate Russian involvement in the 4.5-year civil war. The opposition forces captured Idlib province earlier this year and were pushing to capture the neighboring Al Gharb area that separated them from the coast of Latakia, the traditional Alawai stronghold. The fall of Latakia would have been fatal to the regime. The Russian ground forces could now support the Syrian army to push the opposition forces out of Al Gharb and save Latakia for Assad. It is not clear where and how the Russians could join forces with the Iranians, the Hezbollah and other foreign Shia militias. The Iran-led coalition has been engaged in heavy combat with the opposition in Aleppo recently. Since the beginning of its direct military intervention in Syria two weeks ago, however, Russia has conducted airstrikes against the opposition forces in Aleppo. Russia's goal in Syria is becoming clearer. Support Assad rather than pushing for a political solution and a transition from Assad. And doing so by concentrating its attacks on opposition forces, and not ISIL. "Supporting Assad rather than pushing for a political solution and a transition from Assad. And doing so by concentrating its attacks on opposition forces, and not ISIL." ==> The most tragic being that by replacing the word "supporting" by "fighting" and "opposition forces" by "Syrian armed forces" you get exactly what the Gulf/Turkey/Western coalition has been aiming for. Sad days for Syrians indeed. Even though one has to note that by a purely militaristic standpoint, neglecting the currently hottest and fragile fronts facing government elements and their strongholds from the so-called "useful Syria" and its most concentrated population centers and infrastructure by exclusively attacking IS forces being far away from critical battle lines, Russia would see the SAA find it hard to mount any kind of counter offensives against them in the near and distant future. It has historically been the logic in every conflict since even ancient times : to push back in a war, you start by reinforcing your most vulnerable lines separating your most valuable lands and cities from your enemies rather than trying to attack the most distant foes not posing an immediate threat. in our case, that translates into Russian forces essentially targeting dominant, hard-line elements of the "Army of Conquest" such as Ahrar Al Sham and Al-Qaeda's Syrian affiliate Al-Nusra, equally dangerous and undesirable entities for the Syrian people, for which I will not drop crocodile tears. As for the so-called "moderate forces", I would find it interesting to have an accurate picture of what exactly they are in 2015. Most of what once was the FSA has either been killed, deserted from Syria, or turned to more extremist elements from various horizons often including Islamists. Recent examples of the very first US-trained brigades getting captured or MIA to be later found within Nusra ranks along with expensive equipment, ammo and weapons are plenty to remind us that reality by the day. Qatar-based Al-Jazeera itself admitted not long ago that the FSA retains less than 5% of territory in the whole of Syria today. But I agree entirely, all the above is indeed a purely military way of thinking, there isn't an ounce of political will to stop the conflict diplomatically here on either side, with Washington pumping taxpayers money into failing "Train and Equip" policies and their Gulf allies & Turkey supporting their own jihadist rebel movements with one hand and fainting so far token participation in ineffective strikes with another. That would be what makes today's Syrian youth's hopes for a better future dimmer than ever on top of selective Russian involvement ! Also on a side note, Russian foreign minister Lavrov just a couple days ago openly asked American Secretary Kerry for a detailed explanation/description on the leaders and movements composing what they call "moderates". He went as far as saying that whenever the American secretary was able to furnish at least some accurate data on who some alleged patriotic, moderate Syrian armed elements and their leaders are on the ground, Moscow as well will start to establish contacts and coordinate with them. It is one thing to claim that Russia willingly and viciously targets moderate opposition on the sole basis that they are anti-Assad and Western-supported, it is another to provide proof for that. But still, if it is that astonishingly obvious that there are so many moderate, secular regiments operating in a relevant fashion out there dying under Russian fire, then facts to support it should be easy to obtain as well. I guess we will soon hear from some kind of answer from the American side. Wait & see. Maybe even from Mr. Mc Cain himself, who knows. With respect, the Russians are not rejecting a political solution. However their political solution, which is supported by regional states such as Iran and Egypt, includes a transition that does not dictate regime change for Syria. The RuAF campaign has primarily been hitting Al-Qaeda and their allied groups. Unfortunately, nearly all elements of the Syrian opposition are now allied with Al-Qaeda in one form or other. GW Bush, in the war against Al-Qaeda, once famously said "you're either with us or against us" in the war against Al-Qaeda. Putin has borrowed considerably from that playbook. Howver it would greatly surprise me to see a heavy land campaign commitment. Russian special forces are needed for base protection, CT operations and advising/training. There will be no OIF-style invasion of Syria by Russian ground forces. GW Bush has not been in power for seven years, and Russia cannot use that excuse to justify its campaign against the Syrian opposition. I agree that Russian forces would not, and probably could not, conduct an OIF-style invasion of Syria; rather more likely they would follow examples of Chechnya and Ukraine. Shouldn't we start supporting the rebels with stingers etc like we did with the Afghani taleban against the USSR? Dejavu of the 1980's bache jang style fun with Ronald Reagan's holy warriors? Agreed, GW Bush's infamy should not be an example to follow by any leader today. But why persistently ignore the elephant in the room that is the (largely dominant) jihadist, often Al-Qaeda linked element of the so-called "opposition" leading all the battles on the ground ? what about Lavrov's remarks that have yet to be addressed about what he calls the "phantom" characteristic of the FSA and its affiliates ? where are they ? who are they ? to what extend to they represent the Syrian people ? In the name of the Russian state, he says he is ready to contact them, what are they waiting to react ? Russian are acknowledging the US,EU & Wahabi Persian gulf Arab states, they have will to execute its clear objectives as a Super Power. Many think Russians are there to save Al Assad regime only , but Russians objectives are more than that, they want to settle scores with very big number of Russian origin so called Islamist on forigne land i.e. in Syria or Iraq instead of within its own political bouandry. It is Putin 's calculated move , by exercising such bold manuver in the era of US dominance over the globe, Russians reminded the world that they are still breathing and can conduct any venture. It is also a lesson for bribe oriented wahabi Persian gulf Arab kingdoms, Bribes works but not always, KSA try to bribed Putin by big contracts but finally it not worked. Russians are more practical than US, as we saw US trained terrorists surrender their arms & ammunitions to Al Nusra (second brand of ISIS), Russians are knocking out Al Nusra also as they knew both ISIS ,Al Nusra and other groups, all are similar with different names and all should be treated with IRON HANDS equally, if annihilate terrorist in Syria in real sense. We tend or like to forget how the civil war began and who's responsible here. Assad, representing more than four decades of family dictatorship and corruption in Syria began using arms against peaceful protesters, forcing the opposition to take up arms against his dictatorship. That segment of the opposition has been the main target of Russian bombardments. And it's not all that surprising. Putin, with his checkered past and present czarist tendencies not only is a natural Assad ally, but an opponent of democratic movements and groups. The civil war of course created space for all types of fundamentalists, including an Al Qaeda affiliate, to seize opportunity and grab some land as first steps toward establishing their Islamic state. The most powerful of them is ISIL, which rules over the eastern part of the country. And Putin has had ample opportunity to hit ISIL. Putin's intentions do not appear to be paving the way for the formation of a national unity government in Syria, but to go back to the status quo ante and recreate a dictatorship in the country to "save" it. This is by nature his way. I must have hit raw nerves with above comments! We have received a number of comments full of curses and choice words for this author and the blog that are not fit to publish. I ask Putin's supporters to resubmit their comments, without personal attacks, and keep the debate alive on why Putin is right. We have no problem posting them. Also, this blog represents the views of its authors, which on issues, including Syria, could be different from each other. And we believe that's healthy for our blog. So naturally we accept commentators' varying viewpoints. So cut the cursing, accusations and personal attacks and get to the main argument and we'll post them. We also tend or like to forget who gave ample opportunity to Al-Qaeda and similar groups to make such catastrophic forays into this part of the globe, by exerting physical, illegal, unilateral removal of foreign regimes they sometimes put in place themselves, and armed with WMDs during wars in the 80s. And so with no plans whatsoever for the aftermath of their brutal, bloody invasions taking more than a hundred thousand lives in a single year. (OIF, 2003-2004). I suppose US leaders, in turn, have a "natural way" of successfully exporting democracies around the world. I don't think I ever failed to underline Assad's prime responsibility in that conflict in any of my interventions on this blog, but my point is that it would certainly in no way whatsoever discharge any of the shameful, opportunistic moves by the US & some European countries that instantly attempted at massively funding and arming the emerging opposition without once thinking about who exactly was at the receiving end, and did so alongside notable obscurantist, dangerous regimes like Saudi Arabia and Qatar, widely known hijackers of every single occurrence of the Arab Spring by propping up Wahhabist/Salafist tendencies first and foremost, including through political assassinations like in Tunisia. Cannot we dispute the genuineness of their campaign and its ultimate motives? Does Russia fall under your crosshairs simply because it doesn’t follow orders from people partly responsible for this whole mess? Putin certainly is an authoritarian ruler, and a typical imperialist on top of it. Just like various hawkish American officials still calling for war in Iran today, among other things. But to claim that he is willingly, mostly attacking some invisible "moderates” and so with no tangible proof to support that claim so far, is not qualified as justified criticism. As Mark implied, that "segment of the population" has long stopped from fighting outside the umbrella of much more hardline movements operating in the country, and hanging on token elements remaining here and there in all of your assertions won't change the situation on the ground, nor will a virulent bashing of Putin's person. Bush, then Assad and Gulf regimes share responsibility for the emergence of IS/AQ in Syria, in that order. In that context, Putin has at least equal legitimacy to act to his Western counterparts. In Syria today, the "people in the middle" often do not bear arms, and are victims fleeing by the millions from the conflict. Some of them once did fight in an organized form under a progressive banner. But it is now a mere shadow of itself, ruined by years of multiparty foreign meddling, with each player pushing forward its own groups at their expense. It got diluted, absorbed by much bigger proxy forces. Washington & allies have one thing in mind: Removal of Assad, no matter how many people die for it. Moscow & allies have one thing in mind: Defending him, no matter how many people die for it. None of these endeavors encompass the interests of the Syrian people. Yes, Putin helps Assad, because dictators naturally tend to help dictators. France and Britain have long been out of the game. Obama's "train and equip" program is in shambles, helping the very militants they were supposed to fight. Regionally, it leaves us with the likes of Erdogan and King Salman. Now if I may ask: what is in their "nature" to help happen in Syria today in your opinion? Why disregard their existence among the US-led coalition for a second and not address it? Now let’s have a look at the news: since yesterday dozens of IS targets have been wiped out by Russian forces, whom have demonstrated evidence of them now resorting to humans shields to protect their assets. And probably to the surprise of many, the RuAF refrained from bombing the hell out of everything just for the sake of getting to them, and instead publicly denounced it, video footage at hand! With all due respect , your suggestion of arming the rebels with stinger missiles , is perhaps the dumbest idea put forward in this blog . Sometimes there might be room for being thought provocative , but that idea is just plain dumb and short-sided beyond belief . Putin may be an autocratic leader with very poor human of his own , but the carnage in Syria needs to come to an end .with the takfiri menace totally eradicated . I think the world lost the chance for a decent outcome in Syrian conflict a long time ago .With the takfiris committing all these atrocities at Europe"s door step , It's amazing that there are still people who entertain the idea of arming a very dubious Syrian opposition groups with destabilizing weapons such as stinger .